The summit began on Wednesday, March 27 with a preparatory meeting and continued on Thursday, March 28 where chancellors met and held discussions. This is the first time that a Head of Government from the Virgin Islands is attending the summit, since the Territory officially joined the ACS in late 2018. In delivering an intervention on the floor today, March 29, Premier Fahie conveyed the Virgin Islands’ gratitude to ACS for accepting the Territory into the organisation as an Associate Member. He also shared that the Virgin Islands brings many benefits to the organisation including tourism, the marine sector, disaster management and a unique perspective and response to climate change. 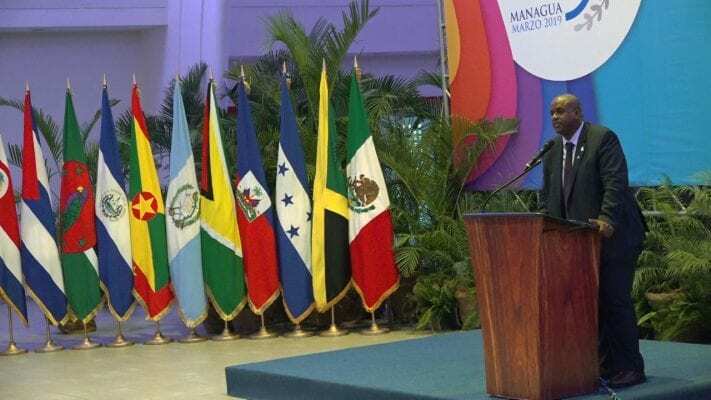 In the margins of the summit, the Premier will hold separate bilateral meetings with representatives of ACS and the Economic Commission for Latin America and the Caribbean (ECLAC). The Virgin Islands delegation is attending the summit with the objective of establishing a presence at the organisation, building relationships with Latin American states and gaining inclusion in any projects, programmes and development cooperation arrangements facilitated by ACS. The objective of ACS is the strengthening of the regional co-operation and integration process, with a view to creating an enhanced economic space in the region; preserving the environmental integrity of the Caribbean Sea which is regarded as the common patrimony of the peoples of the region; and promoting the sustainable development of the greater Caribbean. ACS Member States include: Antigua and Barbuda, Bahamas, Barbados, Belize, Colombia, Costa Rica, Cuba, Dominica, Dominican Republic, El Salvador, Grenada, Guatemala, Guyana, Haiti, Honduras, Jamaica, Mexico, Nicaragua, Panama, St Kitts and Nevis, St Lucia, St Vincent and the Grenadines, Suriname, Trinidad and Tobago, and Venezuela. Associated States are Aruba , France (on behalf of French Guiana , Guadeloupe and Martinique ), the Netherlands Antilles and Turks and Caicos.